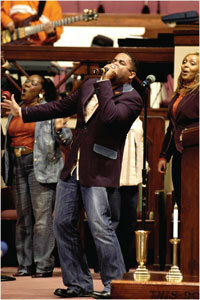 21 posts categorized "Community Focus"
Aborn leader of worship, award-winning gospel artist Byron Cage has come to be known as the “Prince of Praise.” Dedicating more than 18 years to directing worship at two of the country’s most prestigious mega-churches, Byron Cage inspires people to take active roles in bettering their mind, body and spirit. In choosing to partner with the Strength in HarmonySM campaign, Byron Cage has made a commitment to supporting the healthy lives of those who have supported his career. The Strength in HarmonySM campaign is designed to encourage those at risk for chronic kidney disease to recognize warning signs and to obtain early medical intervention. Strength in HarmonySM is being offered by Ortho Biotech Products, L.P., in partnership with The COSHAR Foundation, Inc., a non-profit organization with a focus on health education through faith-based initiatives.I got involved because I have a personal interest and a willingness to be of service,” Cage relates. “I not only have an opportunity to share good music, but to also give a message. My Aunt Liza died of kidney disease, so there is a definite interest on my part to use my celebrity status to heighten awareness in our community.”To read more on this article please purchase: 2006 November/December issue of Homes of Color Magazine.